As they approach the 2018 National Hockey League trade deadline, the Calgary Flames are in a solid position. They sit firmly in the playoff mix; it’s a disappointing position because of all the moves they made to upgrade this summer, but it’s a favourable spot compared to their rivals like the Edmonton Oilers and Vancouver Canucks (who both sit near the league’s basement). Having expended several high draft picks this summer, the Flames will likely package some prospects to upgrade their offense or perhaps even utilize a roster player or two to engage in an old-fashioned “hockey trade” – a swap of NHL roster players that aims to help both teams. Here are, in no particular order, the Flames’ five best trade chips heading into the Feb. 26, 2018 trade deadline. A third round selection by the Flames in 2012, Gillies is presently the starting goaltender for their American Hockey League affiliate in Stockton. After his pro career was derailed by a lingering hip injury, he’s quietly emerged as a very strong goaltender in the AHL. 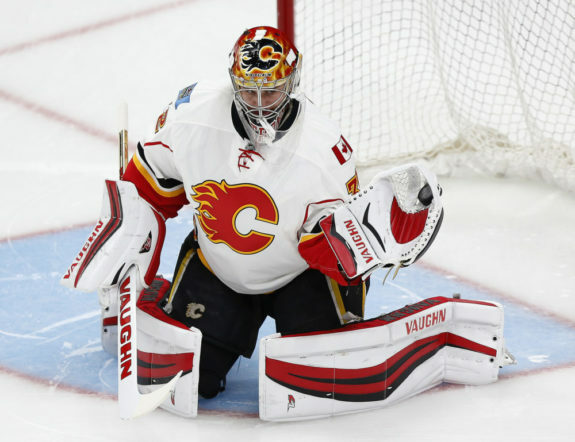 He’s potentially available for two reasons: his old AHL tandem-mate David Rittich arguably out-played him over the past two seasons and was rewarded with the backup job in Calgary, and 2016 second round selection Tyler Parsons may be the Flames’ vaunted “goaltender of the future” and needs playing time in the AHL to keep developing. Moving Gillies would open up a spot for Parsons and allow the Flames to recoup something for a player that, while strong, has become somewhat of a redundant asset. – Could LA be a landing spot for Phaneuf? Originally considered a top-flight prospect in the 2015 NHL Draft, Kylington slid on draft weekend and ended up going to the Flames late in the second round. Just 20 years of age, he’s already spent two seasons in the AHL as a teenager. He’s a smooth-skating, puck-moving blueliner with a few rough spots in his defensive game. But he’s a left shot defenseman in an organization that already has Mark Giordano and T.J. Brodie under long-term contract, has younger Brett Kulak playing regularly, and has 2017 first round pick Juuso Valimaki coming perhaps as soon as next season. Bennett had a productive rookie season in 2015-16 as a winger, but was converted to center in 2016-17. The results have been rather poor, with Bennett failing to get much traction possession-wise or make much hay offensively – even when the Flames gave him strong veteran linemates. He’s been inconsistent in his return to the wing this season, but he’s still very young and has a ton of upside. If he’s a winger long-term, he’s stuck behind Johnny Gaudreau, Matthew Tkachuk, Michael Frolik and Matthew Tkachuk. If he’s a center, he’s stuck behind Sean Monahan, Mark Jankowski and Mikael Backlund. He could be leveraged in a deal to upgrade the Flames’ scoring ranks, and could probably benefit himself from a change in scenery. There’s nothing wrong with Stone. He’s been a rock-solid third pairing defender for the Flames since they acquired him before last season’s trade deadline, occasionally playing in the second pairing during Travis Hamonic’s brief injury absences. But with AHL All-Star Rasmus Andersson pushing for a bigger challenge with his strong performances in Stockton, Stone seems the most obvious piece to move to open up a spot on the blueline. Signed for another two seasons at a manageable cap hit, Stone would give another team a dependable, reliable meat-and-potatoes defender. If the Flames are hoping to make a pure hockey trade and upgrade their forward group long-term, they’re going to likely have to part with one of their key defenders. Mark Giordano is the team captain and unlikely to be moved. Dougie Hamilton has a skill-set that nobody else on the team has, with his combination of speed, offensive awareness and size. He’s not going anywhere. Hamonic was just acquired at the draft and seems unlikely to be moved. That leaves Brodie, arguably the most movable high-profile asset they have. He’s signed for two more seasons and has a unique combination of speed and versatility. But he’s also been the defender who’s struggled the most over the past few seasons – arguably ever since Hamilton arrived in town and was placed in a pairing with Giordano. You’ve got to give to get, and Brodie seems like an asset the Flames would be willing to part with if it gave them another scoring winger.